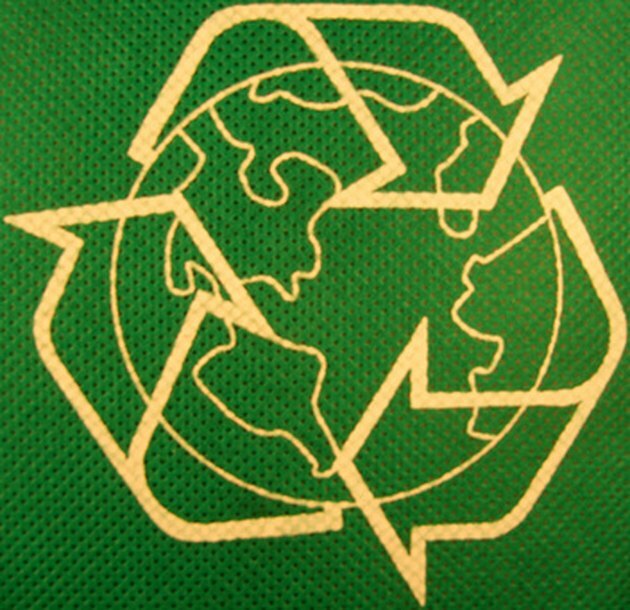 Recycling and reusing would-be trash reduces the impact of household waste on the environment. Laminated paper cannot be recycled in the usual way, by a recycling plant. But you can recycle the paper by reusing it yourself at home. There are many ways to reuse the paper so that it becomes a useful material in your home rather than sitting in a land fill. "Recycle" laminated paper by reusing it. Cut two 3-inch strips of self adhesive magnetic tape with scissors. Remove the paper backing from the adhesive side of the tape and stick the strips onto the colored side of a sheet of high-gloss laminated paper. Place one at each side, or place them at the top and bottom. Place the paper so the magnets stick onto a metal surface, such as a refrigerator or locker. Use dry erase markers to write notes or goals on the white side of the laminated paper. WIpe the marker off with a tissue or dry paper towel. Lay sheets of laminated paper over your workspace. Tape the paper in place with masking tape to protect your work surface from glue or paint. Remove the paper after using your workspace. Wipe it down if it is a glossy laminated paper, or just allow matte laminated paper to dry. Cut your laminated paper into strips with scissors, or cut out images from the printed design. Glue the images onto homemade greeting cards or other paper projects. Shred your remaining laminated paper into thin strips and use them as gift- or Easter-basket filler.